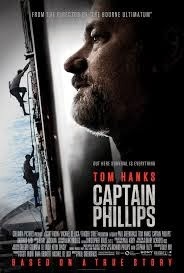 Review: This is a true story about Captain Phillips who got hijacked in 2009 by Somali Pirates. There are two words for this film and they are ‘Tense’ and ‘Gripping’. There is never a moment where you can draw breath because of what is happening. You don’t even have time to look down at your watch in the 2 hours and 15 minutes it is running. The actors don’t stop acting for one minute. When watching this I didn’t feel that any of them were acting. I felt that the whole story was real and unfolding right in front of my eyes. You never knew what was going to happen from one scene to the next. Amazing performances by Tom Hanks and Barkhad Abdi. I hope that Paul Greengrass gets at least nominated for an Oscar. Originally when they had the idea to do this film Ron Howard was going to direct but then went on to direct the film Rush. This is a story that I knew nothing about and don’t even remember it having much coverage on the news when it happened. I went with my mum to see this and when she came out she told me that she felt that she had aged 10 years because of all the tension. I do hope that this gets some Bafta and Oscar Awards. At the Bafta Awards in 2014 Barkhad Adbi got an award for Best Supporting Actor.